The Cultural Dimension of Peace outlines an emerging cultural turn in peace studies. 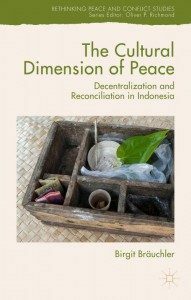 Taking an anthropological view of decentralization and peace processes in Indonesia as its central focus, it provides an informed understanding of the cultural dimension of reconciliation that is essential for the reintegration of societies that have undergone mass violence and long-lasting conflict. Bräuchler’s study warns of one-sided instrumentalization or harmonization theories, and promotes a critical stance towards the use of ‘culture’, ‘tradition’ and ‘the local’ in peacebuilding. Her focus is on intra-state violence between groups defined by ethnicity, religion or other sub-national (or transnational) collective identities. Based on multi-sited and multi-temporal ethnographic fieldwork, this book develops an approach that opens up spaces and sets a new standard for peace and conflict studies and the anthropology of peace. Dr. habil. Birgit Bräuchler is Senior Lecturer of Anthropology at the School of Social Sciences, Monash University, Melbourne. Her research interests lie in peace and conflict studies; media and cyber anthropology; cultural rights; and Southeast Asia, especially Indonesia. She is the author and editor of several books and has published widely in peer-reviewed journals.